JACKSON, Miss. 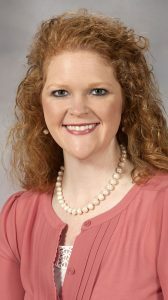 – Laurie Fleming, clinical associate professor of pharmacy practice at the University of Mississippi School of Pharmacy, has been recognized by the American Pharmacists Association with its 2017 Community Pharmacy Residency Excellence in Precepting Award. Besides this honor, Fleming was named the School of Pharmacy’s 2016 Preceptor of the Year by the school’s students. She has been a recipient of the school’s Teacher of the Year award four times. Previously, she served as president and association manager of the Mississippi Society of Health-System Pharmacists. Fleming will receive the award at the APhA Annual Meeting and Exposition March 24-27 in San Francisco.